Sponsored By: Universal Automation & Mechanical Services, Inc.
ANY USA stamped baseball bat with a 2 5/8" barrel. The USA Stampped bats can be any "drop" although the players should start to transition to a heavier bat, since the High School level need to use a -3 wieghted bat. Wood batS. 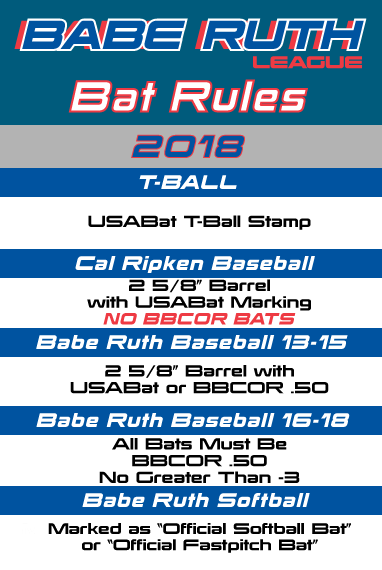 Wood barrel bats conforming to the specifications of Official Baseball Rule 1.10 are allowed. Wood barrel bats conforming to the specifications of Official Baseball Rule 1.10 are allowed. All bats must be certified and marked BBCOR .50 . The bat barrel may not exceed 2 5/8” in diameter or be greater that a -3 length to weight ratio. If the illegal bat is discovered prior to a batter completing his “at bat” the bat is simply removed from play and the “at bat” continues. A player who uses an illegal bat or non-conforming barrel dimension and hits a fair ball will be ruled out. No advancement on the bases will be allowed, and any outs during the play shall stand. This is an appeal play. The “at bat” will be considered legal once a pitch is thrown to the next batter.